Once a week I host a writer who uses music as part of their creative process – perhaps to tap into a character, populate a mysterious place, or explore the depths in a pivotal moment. 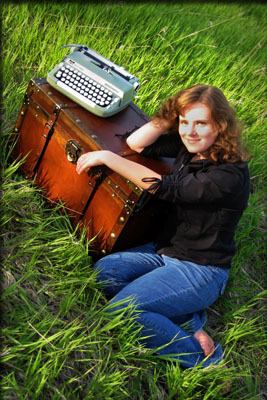 This week’s post is by historical and speculative fiction author KM Weiland. But for all of my very unmusicalness, I am a music drunkard. I am intoxicated by the magic of sound. Even more, I am endlessly fascinated by the power music possesses to tell perfect stories. Even the best of authors require hundreds of words to convey character, emotion, and theme. Musicians share their stories effortlessly and organically in just a few notes. As a writer, I’m determined to steal a little of that magic by imbibing copious amounts of music when writing. For every story I write, there’s always a soundtrack of particular songs that influenced its evolution. 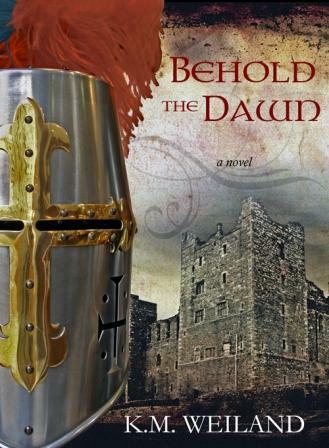 For my medieval novel Behold the Dawn, those songs included everything from Loreena McKennitt’s simultaneously aggressive and dreamy Prologue / The Mummer’s Dance to Within Temptation’s tragic The Truth Beneath the Rose and Ronan Hardiman’s simple love song Take Me With You. But probably the single greatest musical influence on this story was Hans Zimmer’s Gladiator soundtrack. At the time of Behold the Dawn’s conception, I hadn’t seen the movie yet, so I knew next to nothing about the plot and was free to speculate according to the music. The story that arose whenever I listened was one of revenge and redemption, tragedy and love. The music—that brutal, sawing, bloody, thundering waltz of The Battle and Barbarian Horde and the earthy primal call of tracks such as The Wheat and Elysium —told the story growing in my head better than I could ever tell it on paper. The callused, hurting warrior knight Marcus Annan and the battered but unbroken noblewoman Lady Mairead lived within the music Zimmer wrote for a very different story. Themes danced in colors of olive green, yellowed sand, and blue as brilliant as the Middle Eastern sky. In one note, I could hear the whole story, see it spinning out in front of me to infinitude, then disappearing in the next instant as the music thundered on. I took those feelings—and that music—to the keyboard with me, and I wrote it into my story. In so many ways the writing of that book was a special experience (one that often makes me wonder if it was unrepeatable), and I credit it to the music as much as anything else. I finally did get around to watching (and loving) Gladiator and was awed by the entirely different tale that had given birth to the music that had helped me give birth to my own story. Every story I write is a journey through music. This melding of the arts gives me a power in my stories beyond my own ability with words. The deep emotion of the music breathes life into the characters and the themes to the point that I’m almost not creating at all, so much as transcribing the feelings in my chest. That’s the gift of music. That’s why I listen. This entry was posted on February 28, 2012, 11:32 pm and is filed under Undercover Soundtrack. You can follow any responses to this entry through RSS 2.0. You can leave a response, or trackback from your own site. I’m quite fond of Ms. Weiland’s writing and have read several of her works. I find music giving me the visuals and pacing I need for a particular scene, even to the point of establishing the primary tone. This is especially true when I’m writing poetry. I see visions and hear words that otherwise do not exist. ‘I see visions and hear words that otherwise do not exist’ – what a lovely way of putting it, Rich. Those of us who also write to music understand exactly what you mean! Music is crucial for establishing tone for me as well. Sometimes I’ll deliberately choose a soundtrack to match the tone I’m trying to create, but, often, I’ll just randomly select something and see where the music takes me. Thanks so much for having me today, Roz! This was such a fun subject to explore and share. My pleasure, Katie – I love the idea that Gladiator was so firmly part of your novel that when you saw the film it was like an alternate version! Me too! It was like getting two stories for the price of one. I love finding the perfect song for a story I’m writing – even if it doesn’t always happen. And I think movie soundtracks are an incredible resource! I always compile a “soundtrack” for every book I write, usually of “singing songs.” Love being able to envision a character more clearly from listening to a piece of music. Another wonderful post in this series, Roz! Movie scores are treasured resources for me too when I write. I’ve found a Pandora channel that fits my current WIP and while it essentially plays the same 20 or so scores (one of which is the Gladiator soundtrack! ), I am so grateful for its influence and the mood it helps to set and keep as I write. You haven’t discovered Pandora yet? Ooh, you’re in for a treat! My Hans Zimmer/John Williams station on Pandora is my go-to stop for background music. Great selection. Ah, John Williams, lovely. John Barry too – and not just his James Bond music. Ah, a writer after my own heart. The Gladiator soundtrack is a standby on my writing playlist. I also love Hans’ King Arthur soundtrack (although movie-wise I prefer Gladiator). I also have everything Lisa Gerrard has ever done in my arsenal – solo, collaboration, and Dead Can Dance. Since you mention the Middle Eastern sky, K.M., have you ever heard Stellamara? The Seven Valleys album is particularly evocative of the history of the Middle East. McKennitt draws on those influences in her album An Ancient Muse, too. Great stuff here. And Behold the Dawn sounds right up my alley. I’m off to Amazon from here. Vaughn, always good to see you here. I’m sure we’ve ruminated over the qualities of Lisa Gerrard before. I’ve got an album of hers somewhere where she sings a Largo by Handel – lovely and unexpected. Glad I’ve introduced you to Katie! Always a pleasure to come here, Roz! Sorry, I think you’re right, that I’ve mentioned Lisa Gerrard here before. But I do think she bears repeat mentioning. And now you’ve given me a task – finding a Lisa recording I do not own. The pleasure of being introduced to Ms. Weiland is all mine. Thanks! Listened to the Stellamara samples on Amazon. Already in love with them. I’m reminded of some of the music from the Black Hawk Down soundtrack (another favorite). When I first discovered it worked for me, I thought I was the only one too! Then a friend and I were sharing our writing music confessions – and I suddenly thought I’d love to read other authors’ playlists! Lovely to see you here – come back often. I love the “transcribing the feelings” quote. It’s the same for me even though I’m a performer but the beat words sometimes get in the way of writing since I tend to want to sing along. Lovin all these soundtracks, keeping them to put in my Pandora or Spotify tracks. That’s exactly why I can’t write to music with lyrics. Too distracting! Agreed Vaughn. A writer after my own heart. Hans Zimmer is my favorite soundtrack artist across the board. I often write to a playlist of 200+ Zimmer compositions on shuffle….and Within Temptation’s symphonic metal never fails to send my soul on a flight of imagination. I have aspired to write music like that, and I will someday. But for now if my writing can reflect it, I will be satisfied.